Facilities or Fundamentals? What are the Top Things to Consider When Buying Horse Property in Sonoma County? In my post earlier today I talked about the two factors driving most horse property buyers I have met in Sonoma County. I related my own experience buying my own horse property here, and I pointed out a new listing yesterday that fit the bill on both accounts: dialed in facilities well thought out from a horse-owner (and of course HORSE) viewpoint, plus beautiful wine country bonuses–panoramic views, one of the most popular Sebastopol locations, and a good southerly route for San Francisco Bay Area commuters. This has sparked some conversations with other horse property clients and friends of mine. I just spoke with one who said that her thinking evolved as she searched for property. In the beginning she thought it was about finding the right set of horse improvements, such as barn, fencing and arena. Over time (and working with me I might add), her thinking evolved. She began to realize that location, setting, proper soils and drainage were all paramount, not to mention adequate space for her horses. Those were non-negotiable. Facilities she could add. And she has! The further advantage of putting in your own facilities is that you can design them as you wish, for your horses’ needs. No need to adapt to someone else’s vision. Plus horse improvements depreciate rapidly, so the condition of the improvements should be carefully evnaluated. I have seen lots of properties advertised as having arenas which are nothing more than a rectangular fenced area. I have seen covered arenas advertised that had no footing. Horse fencing advertised that is not safe for horses, etc. As we further talked though we discussed some cases in which buying existing improvement can make sense. Obviously if they are in great shape and match your needs, then it is cheaper to buy them already installed. Something which can cost several hundred thousand dollars such as a covered or indoor arena loses that value once installed and a seller will rarely recoup it these days, so you might as a buyer have a good opportunity to get a very nice arena at a good savings. So you can make a case in either direction. One thing to consider in buying (or selling!) a horse property is that it makes sense to work with a realtor who knows horses and horse property so you can fully explore these issues and they will understand your needs and concerns. It will save you time, money and aggravation in the long run, and bring you that much closer to realizing your dream of a horse property in the wine country! posted by Pam Buda // Comments Off on Facilities or Fundamentals? What are the Top Things to Consider When Buying Horse Property in Sonoma County? Is it Sonoma County Horse Property? Or is it Horse-Able? What matters most to you? 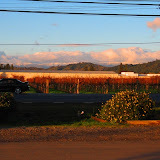 Grazing at Home Next to a Russian River Valley Vineyard”] I have been working on “how-to” series this month. How to Buy Country Property? What you need to know about Water and Country Property. Last but most definitely not least is “How to” buy horse property in the wine country? This blog is called Wine Country and Horses after all. I thought it would be a pretty straightforward matter until I started talking to my clients who have purchased horse property through me, until I realized there was one basic point to consider before getting in to the details. When you buy your horse property, what is most important to you as you search? A. The land, location (including trail access), setting and house? B. The fencing, barn and arena, if any? I realize that my clients tend to fall in to one of the two camps. I personally was in the first camp. The setting and location and to a lesser extent the house were paramout to me. I would have loved to find a property that also had a barn and fencing but that was secondary. I had to find the right place first for the horses and me. For the right price I could buy the property and put the improvements in as I saw fit. When I was looking for my place in 1999, I saw one house in Sebastopol that didn’t do too much for me, but the neighboring property had a nicely put together arena, fencing and a barn. If that one had been for sale at the time I might have bought it. Guess what? It came on the market yesterday. Here is a link to the listing. If you want a combination of a true wine country Sebastopol location, PLUS dialed in horse facilities: a six stall MD Barn with paddocks off the stalls on one side, trailer parking and a bunch of pasture turnout linking barn and a nice arena with proper drainage and footing, here you go. I have seen most of the horse properties, or horse-able properties in Sonoma County. IF you want to learn more, please call or email me. We're sorry, but we couldn't find MLS # 21212955 in our database. This property may be a new listing or possibly taken off the market. Please check back again. Last year’s inauguaral Benefit BBQ for the Sonoma CHANGE Program (Coins to Help Neglected and Abandoned Equines) was a great success!Â A fun event in a beautiful venue that raised significant money to help coordinate efforts in Sonoma and Mendocino Counties to save neglected horses from abuse and neglect. In 2009, your help is needed more than ever. It seems that ticket sales are down this year due to the economy, and the need to help abandoned horses is greater than ever.Â This year’s event is at the beautiful Shone Farm of the Santa Rosa Junior College, on the border of Healdsburg, Forestville and Santa Rosa. Please visit the Sonoma CHANGE website to buy your ticket for this fun event coming up soon on Sunday, September 20, 2009. Â You’ll enjoy a great day with wonderful food, friends and family and lots of equestrian entertainment from dressage and jumping demonstrations, the chance to see and learn about all kinds of horses from Mustangs to Percherons and Friesians.Â Enjoy drill teams, vaulting and carriage driving.Â There will even be a Unicorn!Â What a great way to spend a September Sunday and to benefit a great cause–the health and well-being of horses throughout the North Bay.Â See you there! If you can’t make it on the 20th, the CHANGE website will still accept your donation. If you would like more information about CHANGE, the video below will fill you in. Good friend and photographer Robbin Satterlee was able to capture a range of photos from the Sonoma County Wine and Horse country outside Santa Rosa, with dramatic views of snow covered Mt. Saint Helena in Napa and towards the mountainous Geysers of Lake County to the north. Vineyards, horses and snow covered mountains. Not bad. The snow has melted now as warmer rains have come in but enjoy. We have these snowstorms at the higher elevations (1500 to 2000 feet) a couple of times each winter. OK I really am working on a more serious post about the 4 year high in home sales we experienced in Sonoma County real estate for the month of October 2008, with plunging inventory, but first this fun video for my horse (and camel) friends, from @WalkingHorse, a Twitter friend. posted by Pam Buda // Comments Off on Camels and Dressage? This event also marked the PUBLIC Sonoma County debut of good friend and client Sir William Hamersky and his trusty steed, Rohan, as they demonstrated some of the medieval horsemanship arts. One of my favorite clients is Betsy Bueno. In 2003 she was running her horse rescue operation out of a lovely tract home near the golf course at Shiloh Greens in Windsor.Â I wish I had taken pictures of her front porch–it looked more like a tack room.Â Betsy leased some easement land literally down the block from the city of Windsor for about a dollar a year, and there she cared for and nursed back to health many abandoned horses. Â Â Most of them found new homes and happy lives thanks to the hard work of Betsy and the volunteers at Lost Hearts and Souls Horse Rescue. It was really a challenge to care for the horses from such a location. Twice a day, or more in hot weather, Betsy would have to drag the hose from her house down to the corner and across a busy road to fill the horse watertroughs.Â Meanwhile, she was searching for a home where she and the horses, and her kids could all live together.Â Within a few months the house in the suburbs was sold and Betsy and her kids moved into a beautiful old farm house on over four level acres in a beautiful southeast Santa Rosa location. Fast forward five years and Betsy has joined forces with CHANGE (Coins to Help Abandoned and NeGlected Equines) in order to create a powerful network of veterinarians and volunteers who assist Sonoma County Animal Control in dealing with equine cruelty, abandonment and emergency cases. Â They are also providing support in law enforcement cases to try and prevent more abuse in the future.Â With many people having economic difficulties, having a robust volunteer action network to assist the Sonoma County officials when neglected or abused horses are discovered, is an important link in the equation for horse health in Sonoma County. This Sunday in Glen Ellen Anthony and Laura Ponter, co-founders of CHANGE, are hosting a benefit to support CHANGE at their lovely ranch in Glen Ellen, the Sonoma Equestrian Center from 11 am toÂ 3 pm. Â Tickets can be purchased at the CHANGE website above, or by calling 707 364-2575.Â I will be there along with many horse friends and clients, including the incomparable Sir William and Rohan who will be putting on the first public demonstration of the MEDIEVAL JOUSTING arts in Sonoma County. For an exciting preview, click here. The prince and princess dreamed someday of being re-united with their steeds on a home in the country that would fit all of them someday–but when would someday ever come? Would they have to wait years until retirement, with Seamus and Rohan growing greyer than they already were? Could they ever have it all, and sooner than later? After all, the prince had an opportunity for a new job up towards the area where the lovely vineyards, valleys and horse properties were–could they find a place to live now and continue to work but keep the horses at home? Should they try to find a castle further away that they could retire to someday, and maybe all visit together for summer vacations and holidays? They didn’t know what to do or think, they just knew they wanted to someday all live happily ever after on a farm with their animals, teaching their subjects (more about that later). The princess knew she could stand a long commute 2 or 3 days a week, and she could spend much of her time tele-commuting. They owned their own home on the peninsula of the San Francisco Bay–it was worth a pretty penny. Surely there was a new home with room for the prince, princess and the steeds for what they could afford.